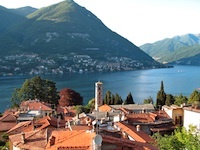 The brick red of old village roofs, the taupe silhouette of a belfry, the lush greenery of trees and hills, and, below them, the azure waters of Lake Como. Colour floods in from the windows of a large two-bedroom first floor apartment in Torno, a pretty village ten minutes from Como. Torno perches on a hillock on the Lake’s eastern shore, just opposite the village of Moltrasio. A tiny marina stretches at the foot of a cream-hued church and, from here, narrow alleys and country paths climb up the hillside leading to terraced fields, old cascine, magical rocky outcrops, and even an abandoned castle that has now nearly been taken over by trees and bushes. Here and there, a parting in the foliage reveals the deep blue waters of the Lake, the lovely village homes and the mountains beyond. The apartment’s windows frame the same azure views but the interiors nearly rival with the panorama. After all, this property is part of an ancient country home, and retains a strong period flavour, particularly in the large sitting room. Think authentic wooden beams, old tiles, and an exposed stone wall in the kitchen. In the living quarters, the decoration and colour scheme, which are in 18th century style, heighten the sense of bygone charm. Equally fascinating is the outside grotto, which has vaulted ceilings and lake views. Next to it is a small private garden - perfect to relax and maybe dine alfresco.